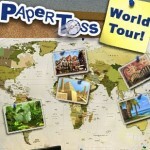 Paper Toss: World Tour is a simple yet addicting game from the makers of Ragdoll Blaster. If time wasting is your thing, have I got an app for you. The idea is simple, toss a wad of paper into a bin. Then, do it again and again. See how many shots you can make in a row. When you get three shots in a row, you unlock the next level of the game. The levels are all essentially the same with a few differences. As you progress through the levels, the basket that you are trying to toss the paper wad into moves farther away. The levels also each feature a different background picture meant to reflect a different part of the world. Thus, the world tour in the title. Paper Toss: World Tour would be a pretty boring game if every toss were the same. Flicking the paper wad at the same spot on the screen over and over would get old fast. However, there is always a cross wind to contend with. For each shot that you make, there is an arrow with a number displayed on the screen, giving you wind direction and speed. You have to adjust the angle of each shot to make it into the basket. The changes in wind speed and direction add variety and challenge to the game. Paper Toss: World Tour is a great way to kill time now and again or just zone out after a long day at the office. Watch out, though, you may become addicted as you try to beat your high score. Nothing makes you want to play again more than almost beating your all time record. Very good game, too bad they left the free version with ads..